When you think of balancing your life, what do you think of? You probably think of balancing work and family. These two areas are the first things people think of when they think of balancing life. And for good reason. Family and work are the two most important areas in most leaders lives. But balancing your life goes beyond balancing your work and your family. 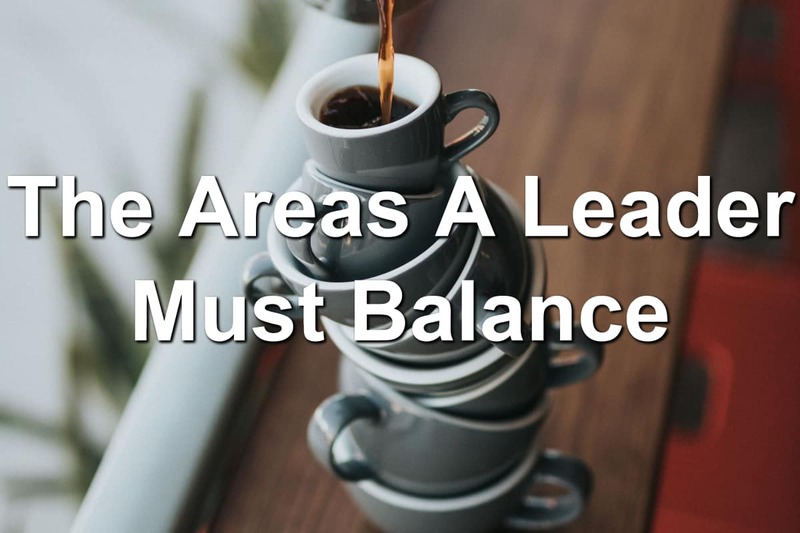 There are many areas leaders forget to balance. This one is a given. Work often takes up 40 hours or more of our lives. This means a quarter of our life is spent working in the office or building our brands. It also means work can easily creep into other aspects of our lives. Set firm boundaries on your work life. Don’t let work creep into the rest of your life. Your wife, your husband, your son, your daughter, or your aging parents. These are your immediate family and they are an important part of your life. Far too often, our family gets pushed out of the way in our search for success. We squeeze a little more time away from them so we can get the big financial project out of the way. Your time is already limited. Work takes up a major portion of your day. Don’t let work take away from your family time. Your work… Your family… these are both important pieces of your life. You also have to remember to take time out of your day for yourself. Finding ways to keep yourself healthy and alert will mean you have to find a way to balance this portion of your life. When do you exercise? When do you take time to do your daily devotionals? Or what about your mental health? Have you taken time away to work on that? Balance your time so you have time to work on yourself. You need to make sure you’re doing something to feed your soul. Do you remember when you were young? You probably had a cadre of friends you could call on. Jimmy would ride his Schwinn bike to your house. Bobby would walk over since he was only two doors down. John would hitch a ride with his older brother to make it to your place. These friends were people you could count on. You knew they would be there for you. Think about now. Do you have a set of friends like you did when you were 8? If you’re like most people, your friendships have been pushed to the side in the pursuit of success. This is tragic. Loneliness is killing men (and women too). You can’t leave friendships out when thinking about work-life balance. You have to think about who is on your team and how you can connect with friends on a regular basis. The community I want to talk about here isn’t family or friends. This community is your local community. You need to find balance within the non-profit organizations and community activities you do. These activities can easily overtake your life and leave you feeling like you’re on the high end of the teeter-totter with no way down. I remember feeling completely overwhelmed because of all the volunteerism I was doing. Multiple nights at church, helping out in the community, and other volunteer positions. This left me feeling exhausted and frustrated. You feel the same way. Make sure you’re not out of balance with the community activities you’re doing. This is one that’s easy to lose your balance on. Question: What are some other areas you need to balance in your work and life? Let me know in the comment section below.